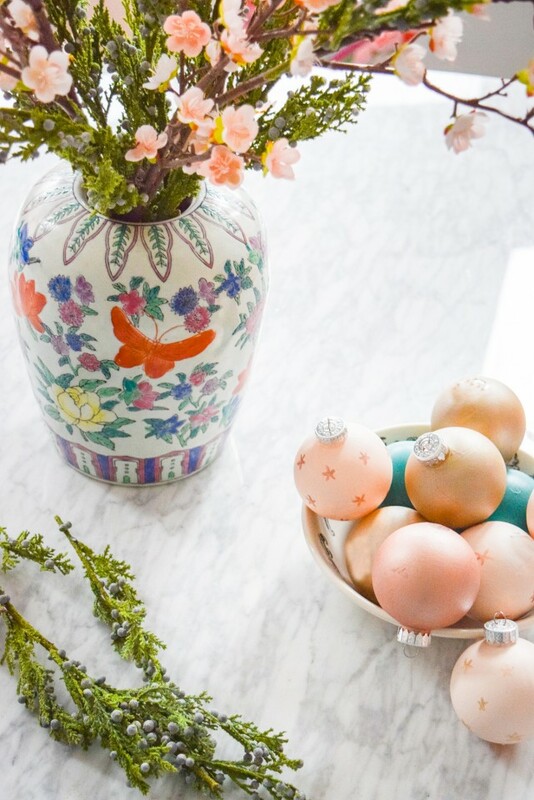 What do you do with extra Christmas ornaments? 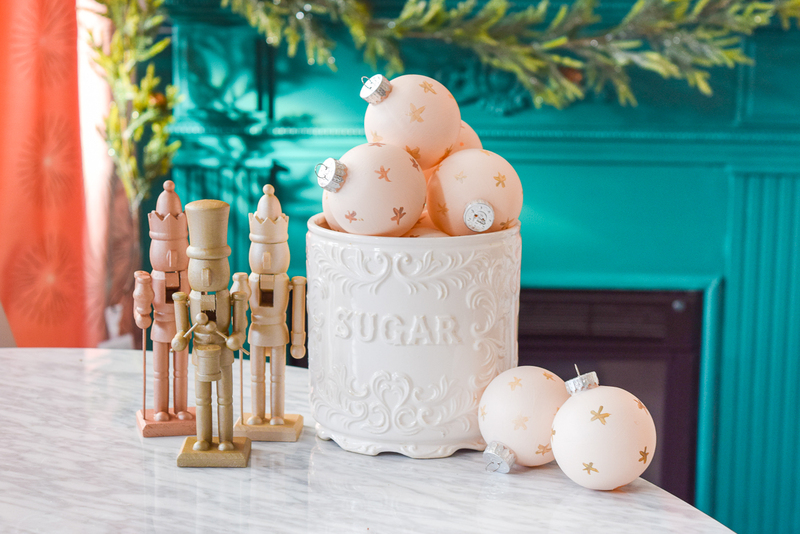 You know, the ones that don’t make it onto the tree or into a bowl or even onto the garland. 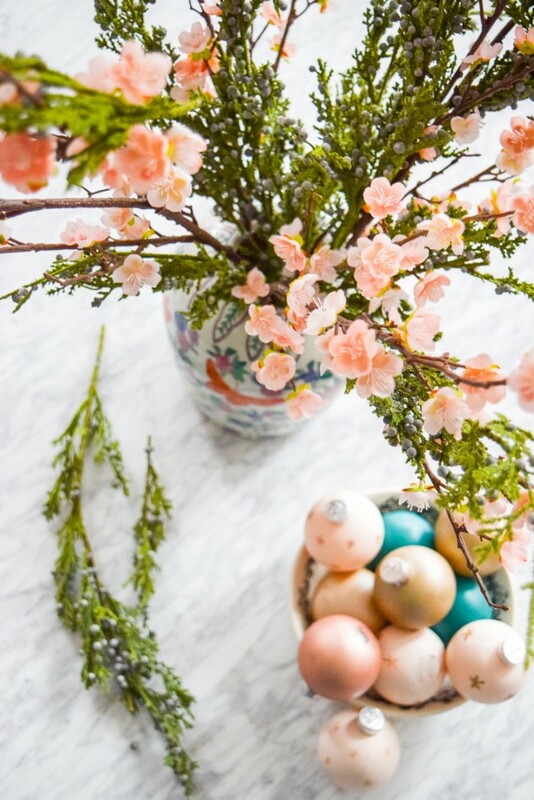 Not because they’re ugly or broken, but just because there’s no room or you weren’t feeling them. 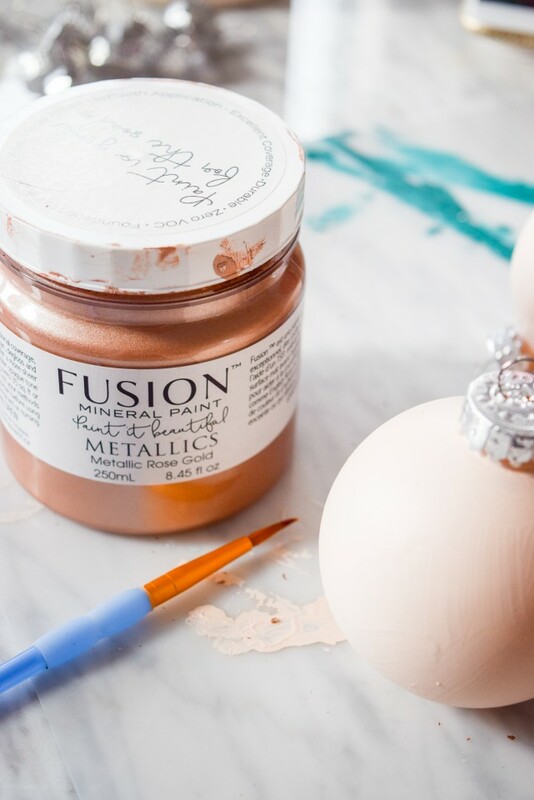 Well, with a bit of Fusion Mineral Paint you can create a show-stopping DIY Floral Holiday Arrangement for the table, the living room, or just the entryway. 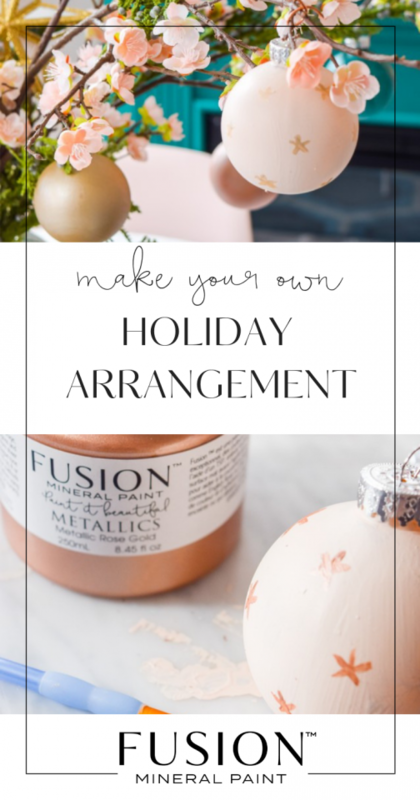 This project is easy to do and is a great way to bring together your holiday color scheme. Hey! 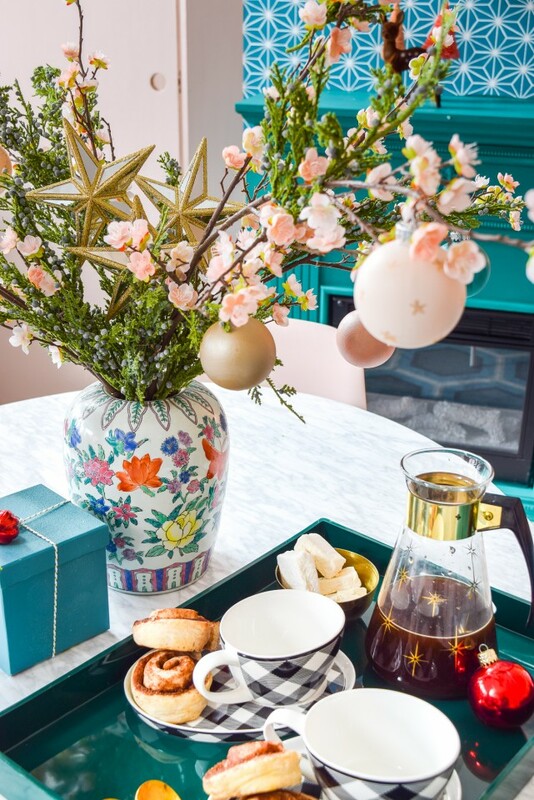 It’s the holidays, you can use seasonal cheer in every nook and cranny. 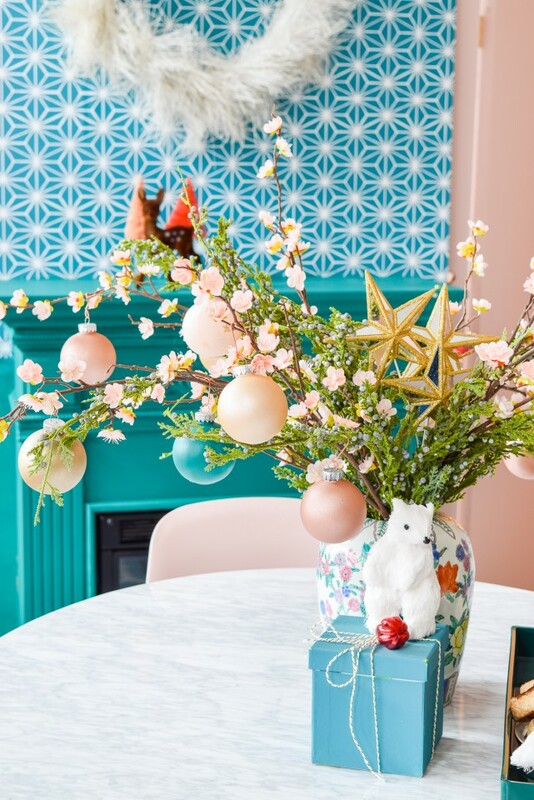 Any excuse to add some fun color throughout the home sounds great to us. 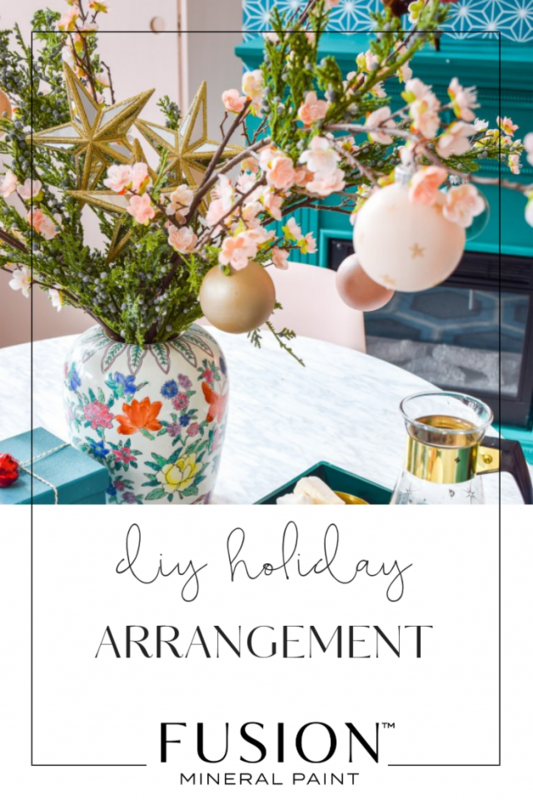 Conversely, if you’re not big on decorating for the holidays, this might be your gateway into seasonal cheer! 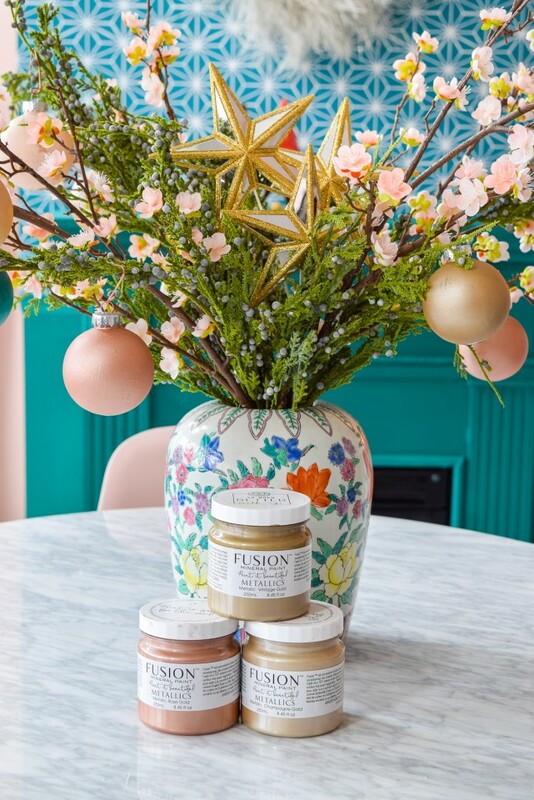 Fusion Mineral Paint from the Metallics line in Vintage Gold, Rose Gold and Champagne Gold. 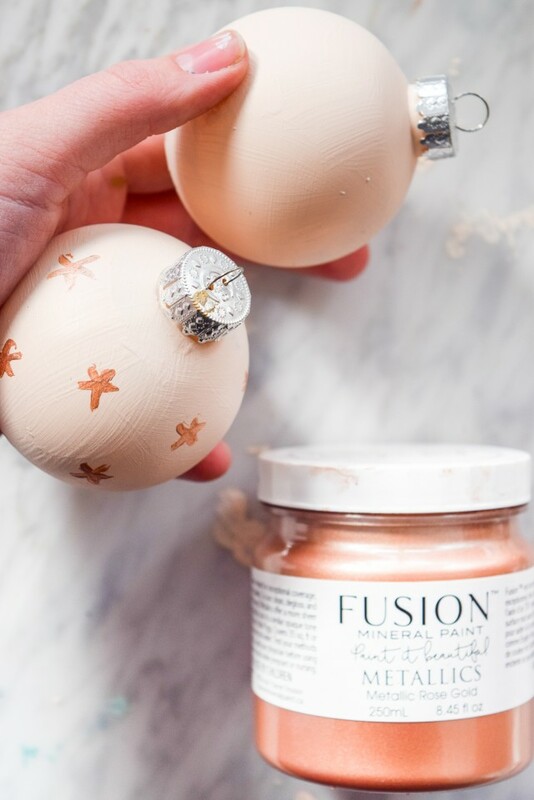 Painting the ornaments is simple as grabbing your paint brush and painting them! 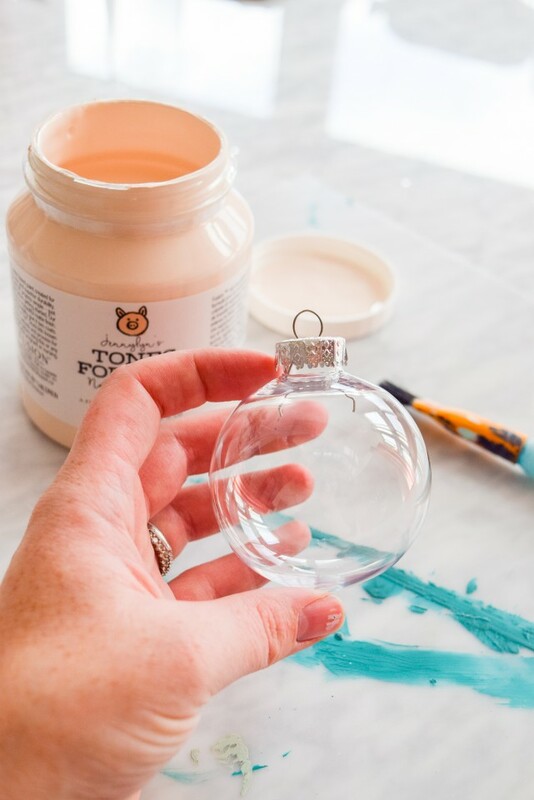 You can do this on the exterior for the old ornaments but for the clear ones, you can do this either interior (by swirling the paint around on the inside until everything is covered) or the outside. Your choice! 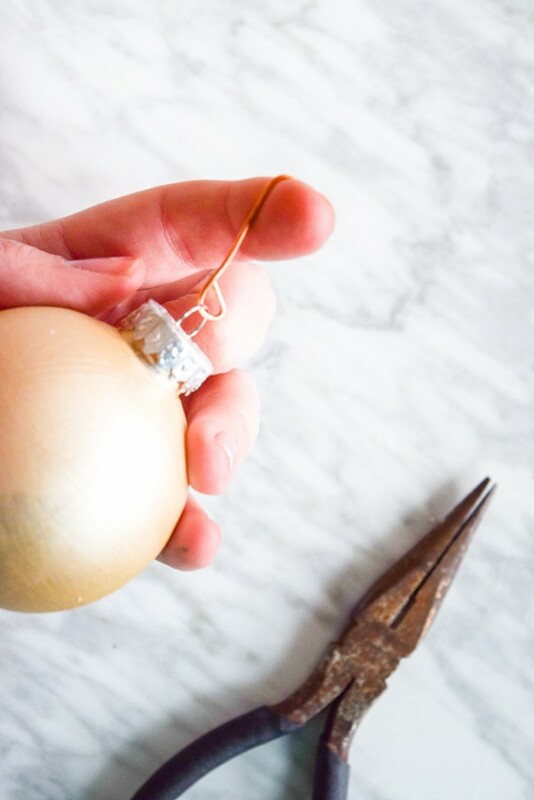 For the flower arrangement, you need something with height to hang the bulbs from. 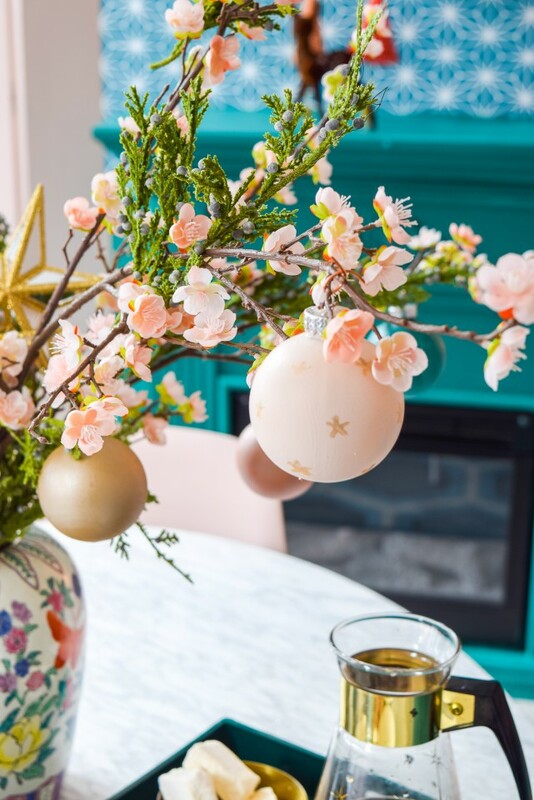 We re-purposed some cherry blossoms and added juniper branches to the mix, to create a seasonal palette that is fun and unique. 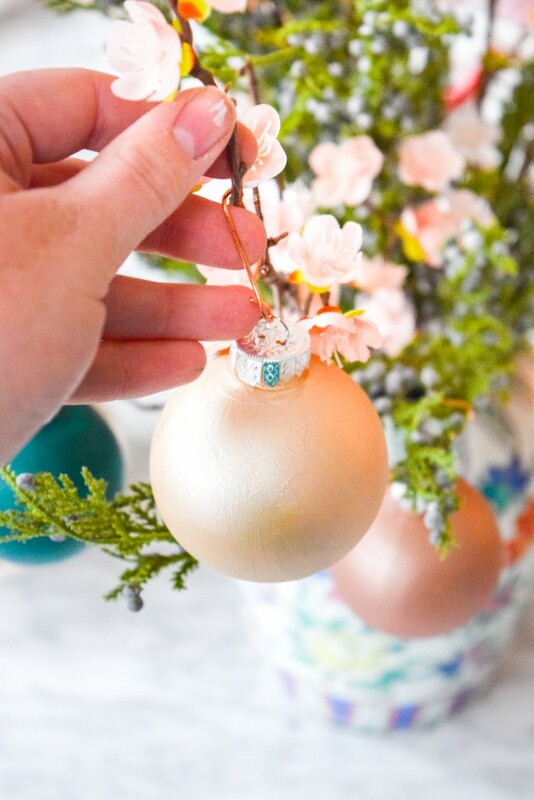 From there, we used floral wire to create little hooks for the ornaments. 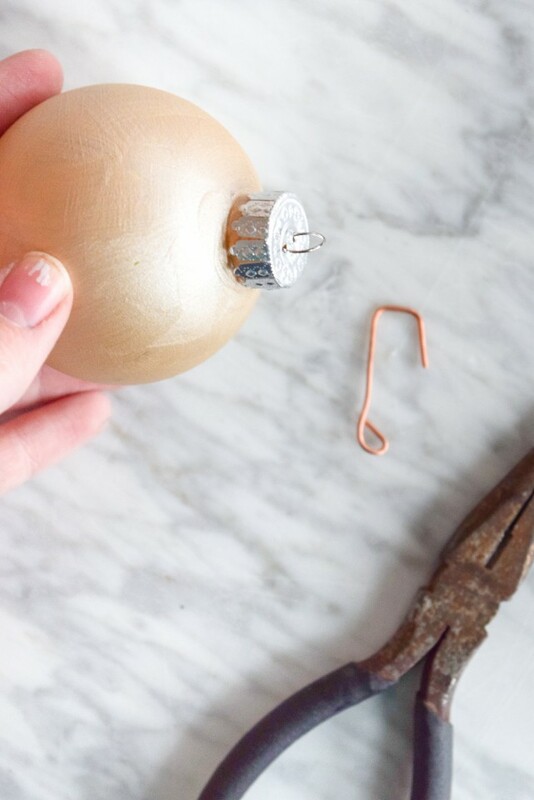 If you have ornament hangers you can use those too, but the floral wire was there and so were our pliers. 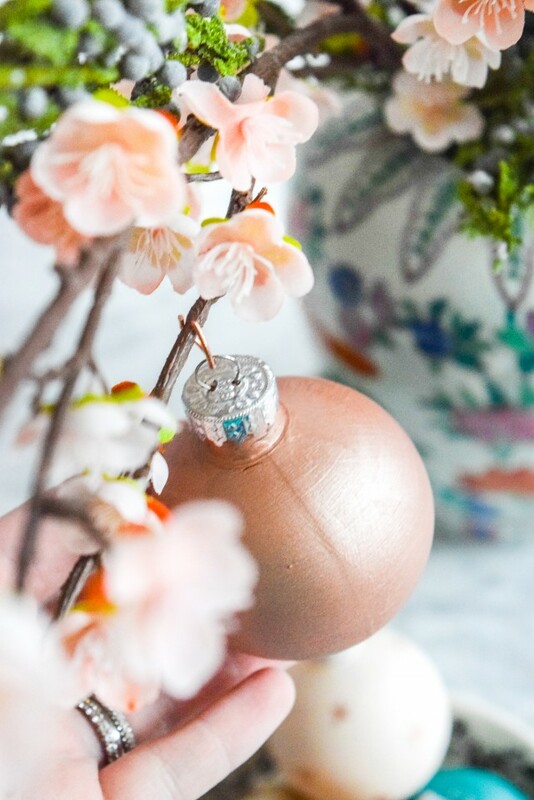 Once the hooks were on, it was a simple as hanging them in the branches of the cherry blossoms. 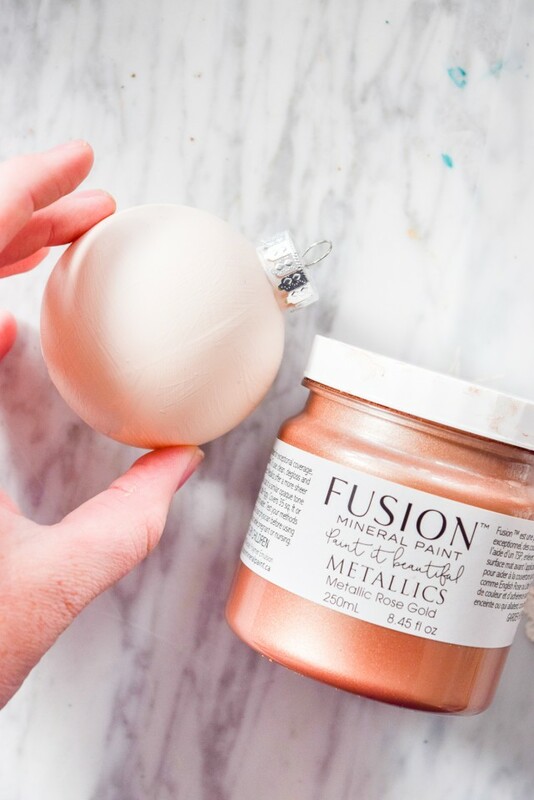 We tried to spread the metallics around so that there weren’t three copper ones next to each other. 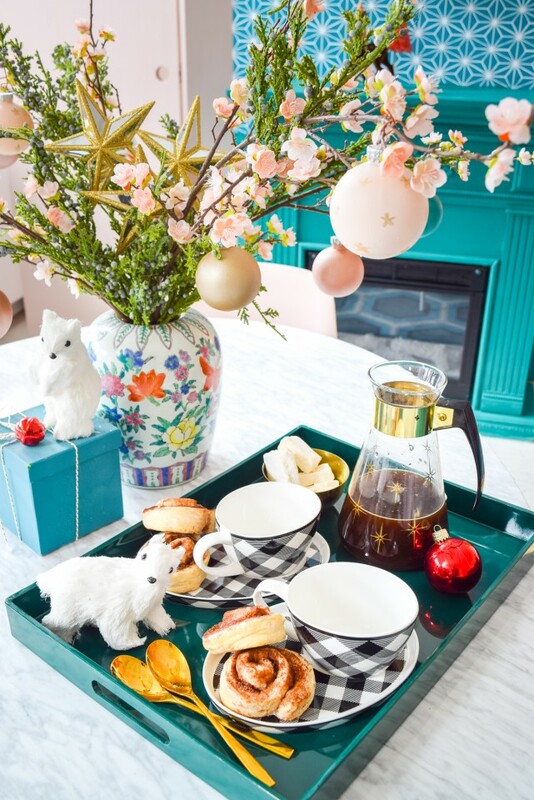 This floral arrangement is the perfect addition to a coffee situation between friends! 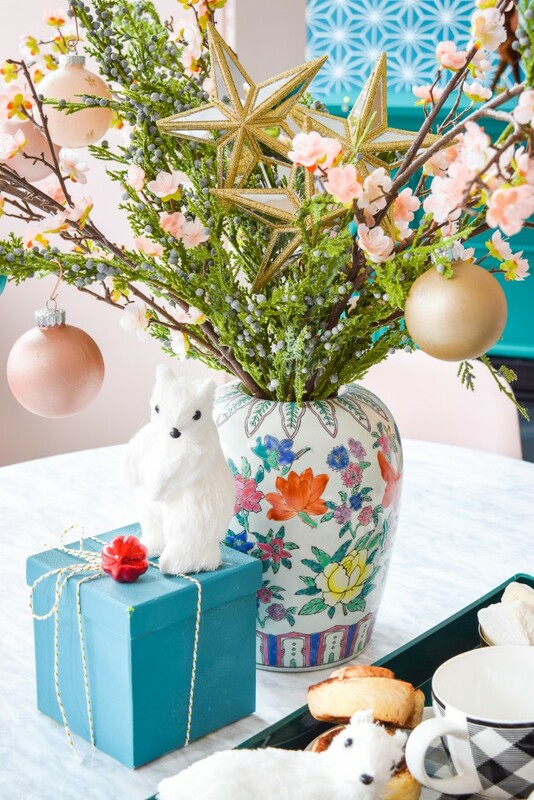 Placed on the table as a simple centerpiece or tucked away into a corner, it’s poised to make an impact. 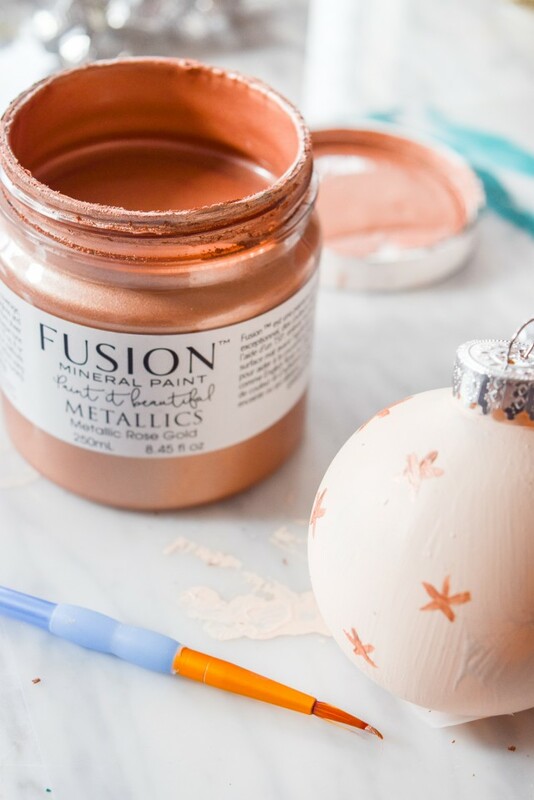 The Fusion Mineral Paint Metallics feel seasonal and festive but also fresh and modern. 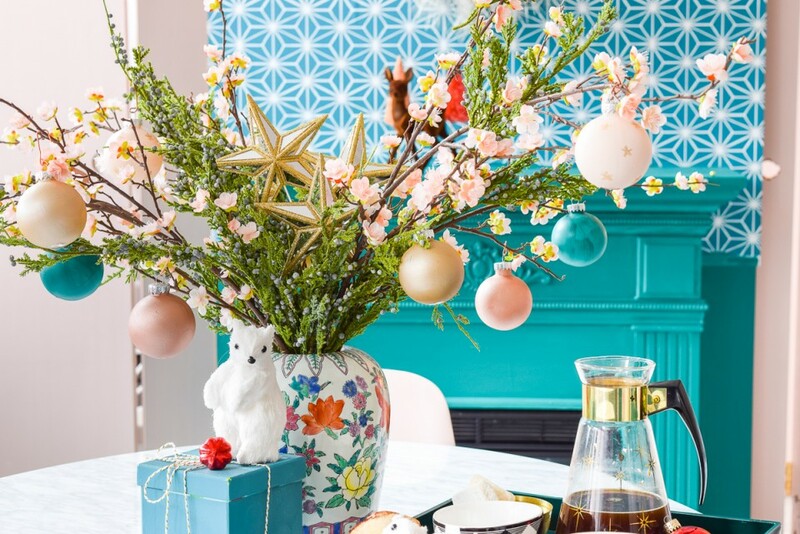 So if you’re looking for something other than a traditional look for your decorations, they’re definitely the way to go! 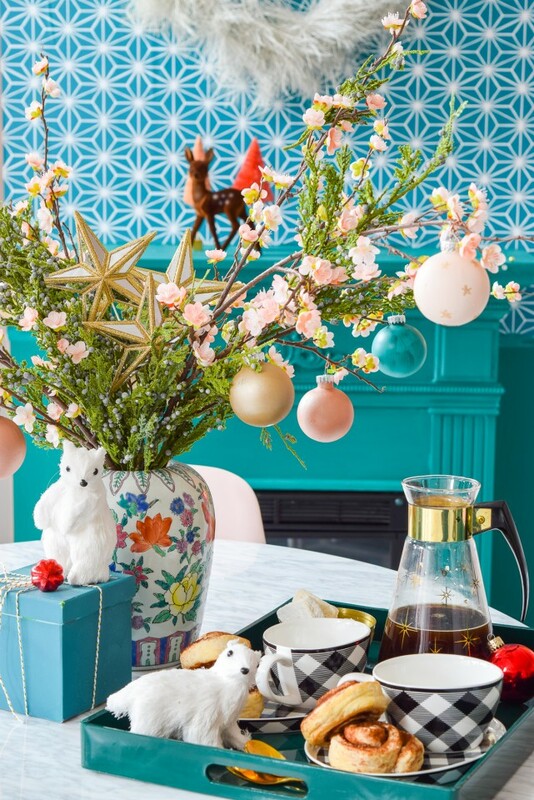 Stay tuned for more Holiday How To Tutorials including a garland and a tablescape to match your centerpiece!